FLORENCE, Ala. – The Memorial Amphitheater has stood for so long on the University of North Alabama campus, some may not remember the original reason for the structure. During its life span, the amphitheater has been used for commencement exercises, assemblies, plays, concerts and many other campus activities. However, its true meaning is in the name. According to an article by historian Robert Steen, the Memorial Amphitheater was finished in 1934 at a total cost of $10,140.66. Dedicated as a memorial to the valor and patriotism of the men of this college who served in the World War. Made possible by the vision of Mrs. Susan Jones Price and the generosity of the alumni of 1934. A total of six students from the State Normal School (UNA) died in World War I. Mrs. Susan Jones Price was the visionary who felt they should be honored for their service. 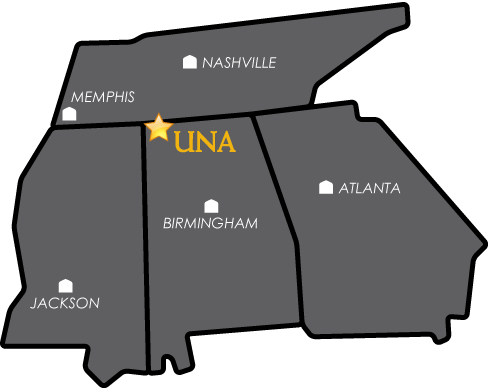 Nov. 11, 2018, marks the 100th anniversary of World War I; all those years later, UNA’s Memorial Amphitheater is still honoring those young men who lost their lives in defense of this country. Five students are listed, because according to historian Robert Steen, original research was limited to Alabama residents. Therefore, Steen concluded that the sixth student-soldier was probably not a resident of Alabama. According to Wikipedia, 116,708 U.S. soldiers lost their lives in World War I, with another 204,000 wounded.